The second issue of Marvel's new Star Wars: Darth Vader comic book series hit shelves this week, continuing the story of the Dark Lord's first mission since he wound up in the iconic armor. This issue sees Vader traveling to the Mid-Rim Jedi Outpost, designation Brighthome, to search the archives for a surviving Jedi to track down and defeat for their kyber crystal so he can build his iconic red lightsaber. This issue is a bit light on plot. Vader looking through the archives of a Jedi outpost to find the name of a surviving Jedi isn't exactly thrilling. Having him go up against the clones led to some cool action sequences, but there was no real drama to it as we know there is no way the clones will be able to kill Vader. I suppose you could make the same case about the hallway scene in Rogue One (though I wouldn't), but at least that scene was crafted in such a way that there was a question as to how the rebels would get away with the plans. Here it just feels inevitable that Vader was going to defeat the clones and it's just a matter of when (not how or if). What the issue does really well, however, is the portrayal of the clones. As a huge fan of The Clone Wars animated series, I love that we got to see what happened to the clones in the days and weeks immediately following Order 66. Writer Charles Soule does an excellent job at capturing the voice of the clones, with his dialogue that feels as though it would fit perfectly in the animated series. It was also intriguing to see the clones react to the rumors that the Empire would not be producing anymore clones. We know that by the time of the original trilogy the Imperial military is made up entirely of recruits, and that clone soldiers are a thing of the past, so it was a nice touch to foreshadow this change. Hopefully Lucasfilm gets around to telling some stories about what that shift was like for the aging clones. The other interesting bit of lore that was introduced in this issue was the "Barash Vow." The Barash Vow is taken by Jedi who want no part in the politics of the galaxy, as Vader puts it, "complete disengagement from anything but the Force." It certainly is an interesting concept and Lucasfilm has done a lot to expand our understanding of the Force and Force-users over the past few years, going to great lengths to establish that Jedi and Sith are just two of many ways to think about the Force. My question on the Barash Vow, and I'll fully admit that I'm nitpicking here, is what makes Barash takers Jedi at all? If they aren't involved in issues of the Order, how can they call themselves Jedi? Why not call themselves something else. We know there are many different Force worshiping/using orders out there (Nightsisters, the Dagoyan Masters, Guardians of the Whills, etc. ), so why call these guys Jedi? Sure, from an out of universe perspective it's an easy to way to have an Order 66 survivor for Vader to track down, but I'd be curious to know more about the relationship between the Barash takers and the Jedi Order on Coruscant. Something that has arisen from this this new piece of Jedi lore is the theory that Luke Skywalker took the Barash Vow after Kylo Ren ruined his Jedi Academy, thus explaining why Luke is absent during the events of The Force Awakens. While it's an interesting theory, I wouldn't put too much stock in it. Yes, Lucasfilm does consider all the stories to be part of the same "canon," but they haven't really set a precedent for introducing important movie elements in publishing prior to the release of the film. Granted, Rian Johnson has contributed notes to Star Wars publishing in the past, but I would be floored if the words "Barash Vow" are spoken in The Last Jedi or Episode IX. Also, it doesn't really make sense based on what little we know of Luke in The Last Jedi. Yes, he has removed himself from galactic affairs, but consider Luke's line from the end of the teaser trailer, "I only know one truth, it's time for the Jedi to end." If that's the case, why would he take a Jedi vow? It could turn out that Luke has take the Barash Vow in all but name, but I highly doubt this vow will factor in the sequel trilogy at all. As for Vader in this issue, I think Soule gives him too much to say--a lot of it being exposition. Looking at Vader in the original trilogy, he was never the one to deliver large chunks of exposition dialogue. In those scenes, he was more of looming presence, only speaking up when absolutely necessary, not delivering long speeches. (The only time Vader ever really gives a speech is when he's making the big reveal to Luke in The Empire Strikes Back). In this issue he has to explain the concept of the Barash Vow for the audience, which felt jarring. In all fairness, Vader is really the only character in this scene but I wish Soule could have found another way to convey that information. Vader has this new droid following him around, maybe the droid could have take some of it. Although, on a separate note, why does Marvel seem to that think Vader needs a comic relief droid (or two) constantly following him around? He doesn't. All in all, this issue is mainly about getting Vader where he needs to go in order for the real action to begin. Soule has done an excellent job with establishing the universe around Vader, even if he struggles to find Vader's voice. I loved what we got with the clones and hope that we get to see more of the post-clone war, clone perspective. I look forward to next month's issue and finally being introduced to Vader's opponent, the Jedi Knight Kirak Infil'a, and hopefully learning more about the Barash takers. 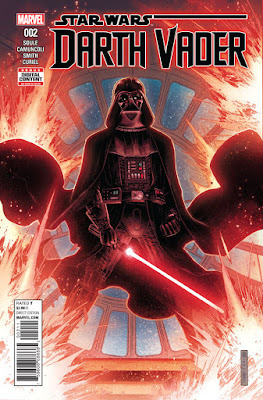 You can read my review of Darth Vader #1 here.